Jupiter Athena Water Ionizer is a Great Deal! With the Jupiter Classic Athena water ionizer you will be getting a top of the line water ionizer at a fantastic price. I have owned and used the Jupiter Athena for about 10 years now, and it's still producing as perfectly ionized water as it did when brand new. The Jupiter Athena is able to produce among the best ionized water to drink. Its water cell packs a whole lot of power to ionize. The way it is able to accomplish that is through science, not size. The technology that goes into making the plates of the Athena water ionizer are far in advance of flat-plate technology, but this technology only works well if it's in conjunction with continuous-cleaning [which it has]. You can read more about the Jupiter Athena's mesh plates and advanced continuous-cleaning system, below.You can count on outstanding performance from this wonderful alkaline water ionizer! Designers: Jupiter Science, located in Japan. Manufacturer: Emco Tech, located in Korea. The Classic Athena is certainly a very well-built water ionizer with wonderful ionization, performance, filtration and "continuous cleaning" of the ionizer plates [see DARC-Cleaning, below]. You never have to wait for the Jupiter Athena water ionizer to do a cleaning cycle, because it all happens behind the scenes all the time! Comparison testing shows that the Athena water ionizer is one of the very finest and best water ionizers with excellent ionization capabilities, continuous automatic self-cleaning, made to last, outstanding filtration and easy to use. 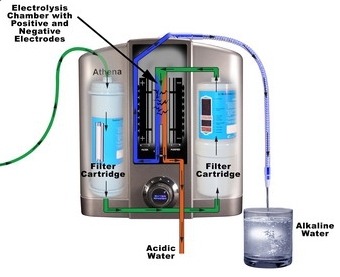 I love the filtration that comes with the Jupiter Athena water ionizer. In the first spot it has a very good activated carbon & sediment filter. 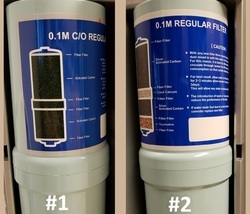 The 2nd filter comes with a more expensive, silver-impregnated activated carbon and biostone filter. Biostone is another name for Tourmaline, which is known to make water passing through it more bio-available to our cells. With these two filters in place you can expect that over 90% of the water's contaminants and up to 85% of Fluoride in the water will be removed. We will register your water ionizer for you. Just email us support@alkalinewaterplus.com with the serial number on the back of your machine when it arrives. All water ionizers are tested before leaving the factory for quality control. For this reason you may find a small amount of water, a few drops, when you remove the plugs. Do not discard these plugs. Please follow these guidelines for removing the quick-connect plugs. Here are a few of the scientific principles used to engineer and design the Jupiter Athena Water Ionizer. DARC [Double-Automatic-Reverse-Cleaning], which is another way of saying continuous automatic cleaning of the platinum-coated plates. Most water ionizers have automatic, but intermittent, cleaning. This could allow for some calcium build-up on the plates because it's intermittent and not continuous. Calcium on the plates makes them less able to ionize at their maximum. It is a scientific principle that platinum catalyzes [speeds up] electrolysis. But, to do that the platinum must be in direct contact with the water. So, even the thinnest film of calcium on the plates can inhibit that water ionizer's potential to ionize fully and efficiently. With the Classic Athena water ionizer the cleaning is automatic and in background. You never have to wait. Having DARC automatic continuous-cleaning allows for the Athena water ionizer to effectively use mesh plates. Water ionizers without continuous-cleaning that have mesh plates are not able to keep them clean enough to benefit from the advanced technology of mesh. The plates are made of titanium mesh [titanium is the strongest metal on earth] coated with platinum, the most rare and expensive metal on earth, and the best catalyst for electrolysis. These plates are designed to never degrade. The amount of power going to the plates during ionization is variable [according to the level you choose], but with the power-booster function of the Jupiter Athena, it is even more variable. This allows you to accommodate for your water source and personal preferences. The Jupiter Science team always ensures the watts never go so high as to jeopardize your plates' structure or integrity of the coating. Some other, less experienced, water ionizer designers have introduced so many watts as to potentially jeopardize their plates down the road. In other words, if the plates overheat, then platinum could potentially be compromised. This will never happen with a Jupiter water ionizer. The engineers are miles ahead of their competition. They are real PHD-engineers and not just dabbling and enterprising with unsafe gimmicks for the sake of more sales. The number and size of plates in the Athena are perfect for most applications. The principles of electronics dictate that the larger the mass of electrodes, the more power is needed to produce any electrolysis at all. Smaller mass combined with a large surface area produces the most efficient ionization. This means the Athena alkaline water ionizer gives a better ORP [antioxidants] at the drinking levels of pH. Micom [miniature computer] System controls every operation of the Jupiter Athena water ionizer to improve performance. The Jupiter Athena water ionizer is a very sophisticated piece of equipment! It has a mini-computer onboard, called MICOM. 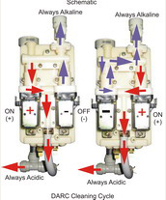 The MICOM control panel optimizes the pH and ORP of your water and helps keeps your ionizer in top working condition. This picture will soon be updated to show the advancements in the new Athena H2. Flow Co​ntrol - The Athena's flow control valve allows you to fine tune the performance and gives you true functional control of the water pressure through your ionizer. Power-Booster Function - The Athena power-boosting function allows you to manually customize your water ionizer to your water source for the best performance at all pH levels. While in "rest-mode" push and hold the right-hand button, then use the top/bottom buttons to toggle up or down in overall power, from levels 1 to 6. Volume Control Function - The Athena volume control function allows you to manually customize your water ionizer's volume to suite your needs. While in "rest-mode" push and hold the left-hand button, then use the top/bottom buttons to toggle up or down from volume 0 to 3. Dimentions: 13" wide x 14.5" tall x 5.5" deep. Installation: The Athena water ionizer can be installed three ways: faucet-diverter, direct-plumbing or under the sink with an under-sink kit and special double-spouted faucet. Soon you will be able to hook the Athena H2 up under the sink with an under-sink kit, which comes with a special double-spouted faucet. Please wait for the updated version though. DARC is an important performance feature of the Athena water ionizer. The patented DARC Cleaning System eliminates the scale buildup that deteriorates performance in other ionizer brands. It allows the plates to be continuously cleaned behind the scenes and that frees up time for you while also boosting the efficiency-level of the Athena to amazing heights! DARC cleaning allows the Athena water ionizer to use mesh plates. DARC cleaning keeps plates free of calcium always and continuously. You never get even the slightest build-up of calcium on plates. There are no better reviews than the Jupiter Athena reviews. This is absolutely the best-made water ionizer that I know of. See reviews below. Filter Options for the Classic Athena: The Jupiter Classic Athena water ionizer comes with very high-quality silver-impregnated carbon fiters, but can use Ultra-Water filters if you want. UltraWater Filters are the best. As an intro to Ultra-Water filters, we will give you a huge, 30% rebate on any and all sets you order with your Classic Athena ionizer purchase. For Warranty details please visit our Jupiter Water Ionizers page.